The backside of the lamp is fitted with the control panel used to adjust brightness and color temperature. With edge-type LED backlighting and efficient diffuser, the device produces even distribution of light across the panel's entire surface. As a result, Thea LED 260 can illuminate the scene without the unwanted effect of multiplied shadows. Moreover, high functionality of Thea LED 260 panels should be also attributed to its small sizes and weight. The very panel weighs only 950g and is extremely thin (15 mm). It also features the mounting grip with tilt adjustment option and fast assembly mechanism. Owing to this solution, the lamp can be easily and quickly assembled on standard lighting tripods, without the need for additional accessories. 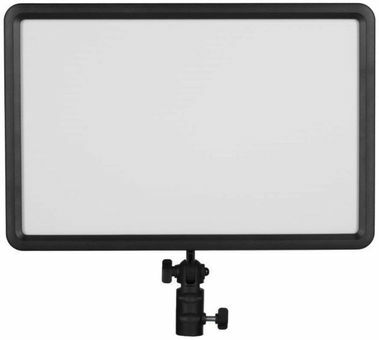 Thea LED 260 panels are power supplied by popular camera batteries, such as Sony NP-F970 (7.4V). To this end, it is also possible to use Panasonic VBG6 batteries through an additional adaptor (available separately). The set also includes the power supply unit which allows the lamp to be used in a stationary mode.